An Annual Music Festival is organized is organised by SAPTAK every year from 1st to 13th January. Saptak music festival was inaugurated by Pt. Ravi Shankar in 1980 and this event is organised by a public charitable trust which runs the Saptak School of Music. SAPTAK Music Festival 2015 the theme of this year’s festival is ‘SARE JAHAN’.For the first time this year Italian cellist Smt. Nancy Lesh will perform and showcase Europ's 300 year old instrument Cello.Also England Pianist Utsav Lal will play classical music using Piano. With nearly 175 top artistes and about 50 performances spread over 13 days (15 Baithaks including 2 morning baithaks), the music lovers from all over India and abroad come here for an unparalleled and amazing experience. The students of Saptak also perform in the presence of renowned musicians and appreciative audience. This musical feast will give you an amazing experience. India's most renowned classical musicians, dancers and singers perform here. This festival showcases the best talents of many musicians and singers who preserve classical music and its standards. This is a pure celebration of music. This Saptak Music festival is very famous event in Ahmedabad city for all music lovers. The audience gets treated to vintage khayal performances from the established maestros. They also have an opportunity to experience the Dhrupad Gayaki, Thumris, Rajasthani Folk Music, Instrumental recitals of Sitar, Sarangi, Flute, the Mohan veena, Rudra Veena and percussion recitals on the Tabla, Pakhawaj and even the Mridangam by the great contemporary musicians. Innovative features of this music festival have been Instrument and Dance Ensembles, Tala Vadya Kacheri, Rajasthani and Punjabi folk music. 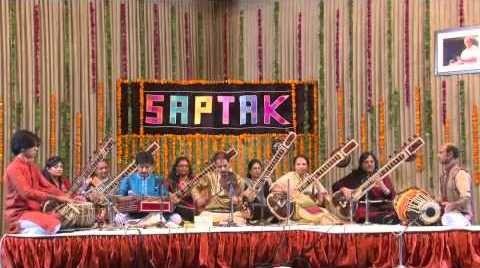 Saptak tries to keeps alive the fading traditions of vocal music like Thumri and Dhrupad, and instruments like Sarangi and Pakhawaj by inviting artists specializing in these fields. Entry in hall only through Invitation. Address: Saptak School of Music, Vidyanagar High School Premises, Usmanpura, Ahmedabad.